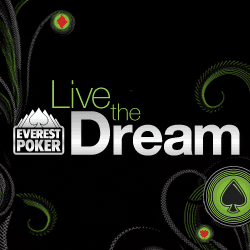 The much anticipated final event of Everest Poker’s Live the Dream promotion takes place on January 9th 2010. Over 200 players from around the world have qualified online to attend the exclusive event in Vienna where 10 finalists will win a one-year sponsorship deal with Everest Poker worth $100,000. The second edition of the Live The Dream promotion is set to be even more successful than the first edition with players going through an exclusive selection process judged by a panel at the Palais Auersberg in Vienna, Austria. Throughout October and November, qualified players were invited to complete their profiles on a specially designed social media platform (Everest Poker’s Live the Dream) allowing them to be judged on their blogging skills. At the final event, players will be judged on a number of criteria including their online and live playing skills, their charisma and their social skills. This year’s event has a few additional twists with Everest Poker adding some new voting options which the player community requested. Players will now also be judged by other players in a “player’s choice” voting system available through the exclusive Live The Dream social platform. The final event will also be heavily focused on poker knowledge and skill and winners will be offered contracts focused on tournament play or with cash game options according to the players’ profile. The 10 Live The Dream winners will represent Everest Poker at the best tournaments in the world for a full year including the World Series of Poker Main Event, and will receive over $30,000 in traveling expenses with packages totaling $100,000 for each player! If you haven’t already signed upto Everest Poker sign up using Everest Poker Bonus code: PNB300 to get $300 FREE. This entry was posted on Tuesday, December 29th, 2009 at 10:43 pm and is filed under Poker News. You can follow any responses to this entry through the RSS 2.0 feed. You can leave a response, or trackback from your own site.